Daniel Kobialka has a varied sonic identity. Well-experienced in the classical music realm, his contemporary instrumental style is immense but intimate. 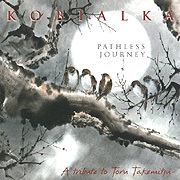 STAR'S END listeners were first introduced to Kobialka through his violin soloing on the album Procession (1983) by Bernard Xolotl. The music on Pathless Journey (69'49") is reminiscent of the new age tinged spacescapes of Kevin Branehy, or the more melodic sections of works by Stomu Yamashta. Each piece typically involves a sustaining pad shrouding a gentle bell pattern or harp arpeggio - together supporting lilting melodies from violin, flute, synthesizer or shakuhachi. Perhaps the most powerful track is also the most stripped down. Playing slowly and without accompaniment, Kobialka's violin resounds through cavernous reverb in a plaintive cry to the Universe. But the primary feature of Pathless Journey is its ability to sustain, over time, an atmosphere of contemplation and beauty. In the passage of a few moments each composition stills the listening space with sweeping drifts of euphony. With this music as your soundtrack, minutes seem to stretch beyond the confines of the present - and into an area where consonant sounds provide pastoral serenity.